Karachi’s citizens have some distinct traits that make their city what it is. A few of them are their reverence towards the sea, their ‘life goes on’ attitude in the face of the city’s unpredictable halaat (security conditions) and their undying thirst for chai. Then there is one more characteristic Karachiite obsession that is so omnipresent that it almost fades into the city’s background — their love for paan. Everywhere you turn in the city, you come across paan khokas (makeshift stalls). Such modest two-and-a-half-by-four feet kiosks hold ingredients to make numerous types of paans that would satisfy anyone — from a tired labourer to a high-flying socialite. In the post-lunch hours on a weekday, the usual hustle and bustle associated with Burns Road has temporarily died down. Eateries are relatively empty and vendors are preparing for rush hour. Not Muhammad Umar though, whose paan business is booming round the clock. Customers surround his small kiosk. Some purchase loose cigarettes and light them with a lighter tied to the stall’s window. Others order different types of paans. Umar prepares them with the speed and precision of a pro. It is a treat to watch him in his element. He picks out different ingredients swiftly putting just the right amount of each onto betel leafs. He has been in the business for a long time. He learned the craft from his father, who, too, had a paan stall. Muhammad Umar's Burns Road khoka is in high demand. Umar’s red lips indicate that he does more than just sell paan. He seems to be a man of few words at first. This illusion, however, is broken when he spits out a mouthful of paan juice and starts talking. A cigarette brand has provided Umar’s kiosk. The white and gold stall is replete with the company’s branding. He thus does not have to worry about rent, unlike other shopkeepers. Perhaps this is why his paans are cheaper than the competitor’s. Or maybe it is the close proximately to Paan Mandi in Jodia Bazaar — the market where most paan salesmen buy their ingredients. Meetha (sweet) paan costs Rs10 at Umar’s stall. He sells other paans at seven rupees a pop. In contrast at Moosa Pan Shop on PIDC, the offerings are much pricier, and if shopkeeper Abdul Qadir Malbari is to be believed, far superior. Malbari, who has been doing this for 20 years, says that at roadside kiosks the paan is made in Pakistani leaf, which is bitter. A young man and his sister come to the store and order 20 paans. “Ensure that they are wrapped in golden paper,” the man stresses. He is buying the delicacy for his sister’s future in-laws. Be it a celebration or a trying day at work, there is a paan for every occasion. Another man comes to Moosa Pan shop, quickly buys one with tobacco and races back to work. 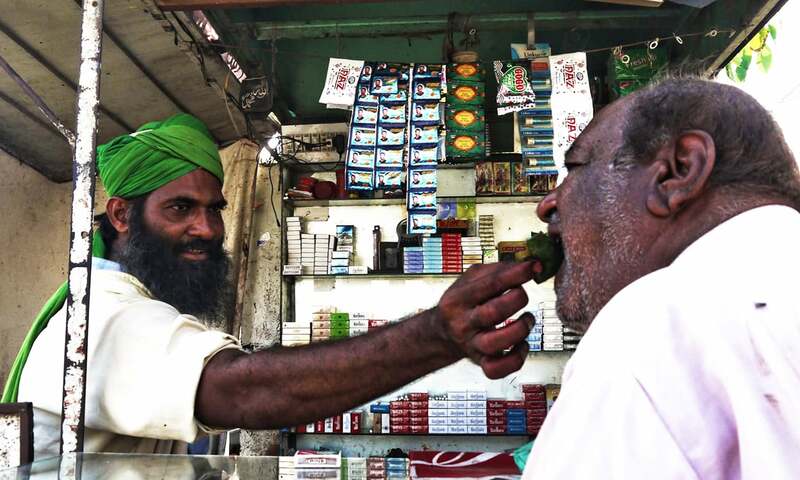 When asked what kinds of customers buy tobacco-filled paans, the shopkeeper says those people are the more “professional paan eaters” — ones who need the narcotic kick to get through the day. One such regular is standing at a paan stall in Sindhi Muslim Society. The man, Sultan Hussain, patiently waits for his order to be prepared. He lives in Gulshan-i-Iqbal but makes a trip to this particular khokha almost every day. This is where the best tobacco paans are available, he says. “The magic is in the katha [catechu mixed with water to make a paste],” Hussain says. There are many variations of tobacco paans too, he explains. “There is Patti Tambaku, Mumtaz Tezpatti, Muradabadi, 120 Number, Indian Patti, Shahzadi Patti, Azizi Patti,” he names a few. Instead of one of the more exotic sounding paans with Mughal-era names, however, Hussain opts for the Mix Tambaku paan. Sultan Hussain at Ghulam Yasin's paan stall on Sindhi Muslim Road. He eats 20 paans a day. The middle-aged man has been a paan-eater since the age of 20. “The first time I ate a paan with a friend, it was a Saunf Khushboo. My friend made fun of me for eating such a zanana (feminine) paan.” He thus switched to the supposedly more mardana (manly) tobacco paans. Hussain thinks he can easily beat this habit anytime he wants. “You know I fast the whole of Ramazan. For that month, I go through the entire day without a single paan. From Iftaar to Sehri, I manage to eat about 10, and that is sufficient for me,” he says with unmistakable pride. Navigating through a traffic jam-packed Jodia Bazaar is not easy but Paan Mandi is curiously quiet. Some vendors with baskets full of leafs are sitting on the sidewalk of a small alley. His earnings are unpredictable and depend on how many customers come to the bazaar on a certain day. In general the ‘Sanchi’ leaves are sold for 100 rupees per kilogramme, while 50 grams of ‘Silon’ are sold between the rates of 60 rupees and 80 rupees. There was a time when imported leaves would sell for 300 rupees to 500 rupees per kilogramme, Umaruddin shares, but those days feel like a distant memory now. 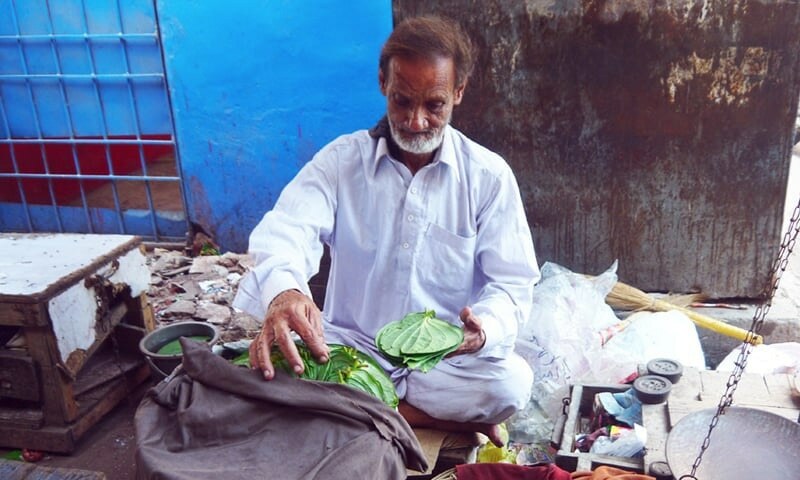 A vendor at Karachi's Paan Mandi. 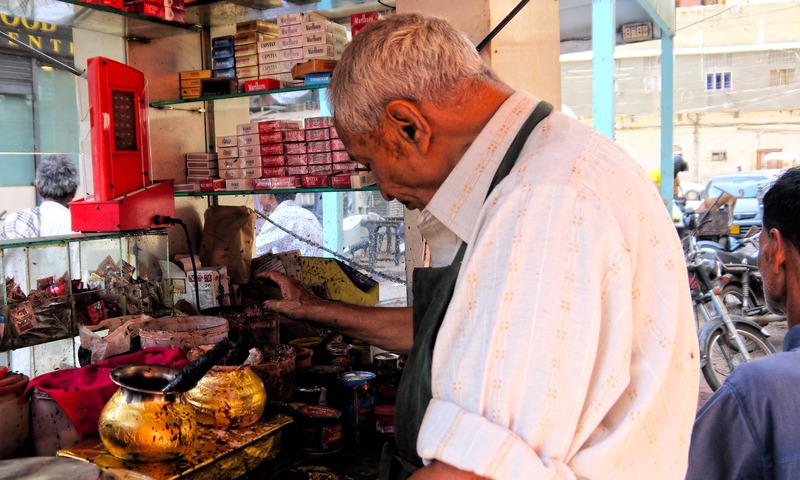 Venturing into an explanation, Munawar, a paan ‘cabin’ owner for the past 20 years, says that in certain areas demand for paan has taken a hit with the rise in gutka culture. Munawar’s khokha is in Dhobi Ghatt. “I sell paans for as low as five rupees,” he says. Another shopkeeper playfully interjects: “What you sell isn’t even paan. It is just the leaf with a few pieces of chhaliya [diced areca nut], of course that will cost five rupees.” Even at this price, most are no longer interested in what he is selling. “Now everyone asks for gutka from India,” Munawar adds. There may be more to the story: Another storeowner, Salman, shares that while readymade paans continue to sell in Karachi, the tradition of homemade paans is dying. 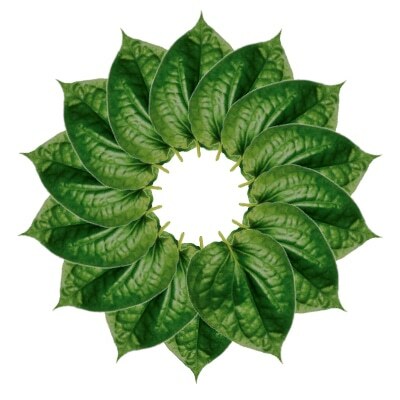 “A good majority of our customers buying betel leaves and other ingredients are either older in age, or are making the purchase for their parents or grandparents,” he adds. But with time, this generation of homemade paan eaters is fading, and so is the culture. People visiting Javairiya Abbas’s house may think the beautiful golden paan-daan in her house is a decoration piece, but it is more than mere ornamentation for the young woman. It belonged to her grandmother, Naeema Khatoon. Naeema Khatoon’s paans were famous even in extended family and friends; visitors would always request her to prepare paan for them. Abbas lost her Dadi last November. She now considers the paan-daan a family heirloom. I really hope that Gutka from India or elsewhere is banned before it causes an oral cancer epidemic. This stuff kills! And it a curse too. The health effects of the paan eating should be highlighted so that the young generation stays away from it. But of course this is a nation of earning money, whatever the case may be. so give your generations the disease, and suffering. I wish and hope some day those paan khokas and similar outlets be flys free. @Pak Karachi's pan stained streets, sidewalks, footpaths, staircases and stairwells are a shameful testimony to Karachites love for Paan. There are NO Paan shops in entire Pakistan except in Sindh. Paan is just as bad as smoking. I hope the new generation in Karachi stay away from PAAN. I especially like the toxic pink color in the paan. Disgusting hygiene level, not to mention the carcinogenic chemicals in it. Wonderful piece! Thank you Dawn. @Hamid - and what about the health of human beings! Is there a difference between this and cigarettes and soft driks!! Anything goes that helps circulation numbers in today's business community!!! If you could also have an article highlighting the health hazards of regularly chewing on a paan. This article seams to be glorifying the paan. I started chewing paan at a very young age, that mother did not approve off, but gave up and stopped admonishing me for that. My office was in PIDC House when I started working . After work I would buy a paan with loong , illachi and a dab of kheewam, and few loose cigarettes from that famous Moosa Pan shop and walk to Cantt. railway station, to catch a train to my home in Malir, while chewing paan and smoking. In the evening after supper I would have a paan from Jano's khoka in the neighbourhood. Some forty odd years ago I moved to north America and live in a city that has a large south Asian population and number of paan shops to cater it. However the paans are not the same as of Moosa and Jano. Thanks, Dawn for taking me down the memory lane with this wonderful article. i could see 'Baba-120' Zarda in the 1st Pic..They go great along with paan..A Paan after a sumptuous meal is heavenly !! Nice Article but there is no hygiene in these khokhas. I wonder how people ignore all these flies and dirt around the khokhas. I hope the Govt. steps forward to maintain the cleanliness of the eateries in the City. Thanks. Paan in the South, Naswar in the North and Hukkah in the middle, LOL and filth every where. Sorry to know paan leaves from Bangladesh are so expensive nowadays. It was very cheap once upon a time. I wonder if paan leaves can be grown in Pakistan. Paan trees need huge water or regular rainfall and it must be grown in a shadow place not directly under sun shine. Baba 120 on the background shows the common and shared culture. So does the flies hovering around the pan.. Wish the writer could include Kalkatti, Benarasi, and Bangla patta too. Don't know if they are available in Pakistan though. Most uncivilized of habits ever seen anywhere around the world. i think we should have a yearly paan festival in karachi. some one should take lead on it. Benarsi and calcutta pans are famous indeed.... There are many Bollywood nos. on pan... The most famous being Asha Bhonsle's song in Tisri Kasam "pan kaye sain amaro..." and Kishore's song in DON "kaike pan Benaras wala...." are the most popular numbers..
@My2paisas Pakistan and India have One of the Highest Oral Cancer Rates. Paan gives self-employment opportunities. But it is a complex business. One needs to have knowledge of so many items that make a paan. And no business management school teaches how to set up a paan shop. It all comes by experience - what we call in the management jargon- shop-floor training. To save oneself from cancer,just eat plain leaves of paan,and that too not on a regular basis. Only occasionally. Try eating paan with dry fruits like dates,kishmish (Afghan),and it is the real paan,and not with supari and other stuff like chuna. World famous Pan is Banarasi Pan in Vanaras Uttar Pradesh India. @harish jurel You are 100% right most of the paan culture in Karachi is from UP. Wish so many immigrants from India (Mohajirs) living in Karachi, they brought a little bit of beautiful Varanasi in Karachi. If you ever go to Karachi you will hear the dialect of many Karachiets is the same as UP, although the distance between Varanasi to Karachi is so far on the map, Karachi is very diverse and historic like the beautiful Sindh Pakistan. Very uncleaned shops and unhygienic too! I will never eat from these shops. My wife likes PAAN, I get a sweet PAAN for my wife every night after dinner. We are newly married. Was fortunate to have paan at Mumbai Chopati and man, you can't find something even close in Karachi. The most delicious Paan i have ever tasted was in lahore at Jane Mandar. Awful habit! should be banned! one who eats 20 paans a day is prone to (God forbid) most fatal cancer. One should eat one for a joyride or to celebrate some moment. Paan chewing is seen as a traditional value in subcontinent though, it is responsible for dirty smeared walls and filth at every nook and corner of cities across subcontinent. Strict laws with combination of continuous awareness campaign should be introduced to People and culprits should be punished and fined, like they do in cantonment areas. Bad habit leads to ugly looking mouth and teeth. Thumbs down to the bad habit. Chewing pan is plain smelly and ugly. This culture makes a person look hideously repulsive. It should be banned in this planet. Love the Pan Any Time, Thanks Dawn for the wonderful Pics. Another aspect of Paan post dinner is it's digestive and aphrodisiac impact especially the Keemam gold/silver and one in UP known as "Palang-Toood" but these are very expensive range b/w 1.000-10,000 INR a piece. I do not know about pan eating habits of pakistanis but in India particularly in Eastern U. P. and Bihar it is a curse from God almighty (Khuda ki mar). The habit of chewing and spitting at will is rampant and red stain on roads, buildings and stair cases is a repulsive sight. Never eaten a pan in my life for this reason only. @jawad Actually , it's the tobacco which is bad. Without it, Paan (if used with a spitoon), is pretty harmless. Paan is good for health, meanwhile Paan juice should be spit out in destined place. @IMTIAZ ALI KHAN welcome bro in UP. Is the word ‘Silon’ is same as 'Ceylon' ? One more bad thing common in India and Pakistan. Thank God rest of the Pakistan is not suffering from paan eating disease. It's just gross! Pan and Gutka should be banned..
@GilGit corruption does...Nice try alll.. No excuses! one should eat only metha PAAN for the sake of interest, but not be habitual. become addictive on anything is bad for your. but few times its not bad. Try Meetha Cold Pan. (there are few shops in 80's and still put meetha pan in fridge. it's worth trying, few times. @jawad You don't go out much - do you? I live in Peshawar and there are at-least 7 paan shops with-in 2 kilometer radius from my home. And two of them are at-least 40 years old. Not many people eat paan regularly but many many eat meetha paan once in a while which keeps these shops alive. I dont judge people who eat paan as long as they dont spray the 'peek' on the road or on the walls. so many people smoke or eat junk food - what's the big deal with paan then? For those who are complining of this delicacy as being hazardous. Let it be known that what you breathe in the heavy karachi traffic is more dangerous than Paan. I rather die eating this than inhaling that nasty fumes and what not. Paan is the most Dirtiest thing made by people. I really feel sorry for the people who are hooked on Paan. It should be banned, and the pan-sellers should be given other opportunities to start other small businesses. Besides, the use of paan by those outside their homes generates unwholesome sight with the chewer spitting anywhere and everywhere he/she pleases. The roads, roadside walls and insides of buildings, especially the staircases, giving a very offensive and repulsive outlook. The habit of paan chewing has, over the years since independence, caught on with people of all ethnicity. Use of other injurious chewing products alongside the paan or separately is the basic cause of rising instances of oral/mouth cancers of sorts. The government should immediately ban the use of paan and other chewing products and enforce the order through a ban on import of these 'killer' products. Warning notice is placed on cigarette boxes. So why cant we place similar notices on all Paan khokas. The period post 1971 war with India was the best time when the 'paan' chewing habit could have been effectively done away with as the supply of the beetle leaves got disrupted with the secession of the eastern wing. However, this opportunity was lost as Sri Lanka moved in to satisfy the craving of increasing number of paan consumers. The result is for every one to see and behold - the offensive sight of paan residue spitting soiling the roads, buildings, and whatever comes in the way when the paan guzzlers feel the urge to relieve themselves of the burden. Please, get rid of this unwholesome habit as a nation. As a first step, our capital should immediately be declared a paan-free city.